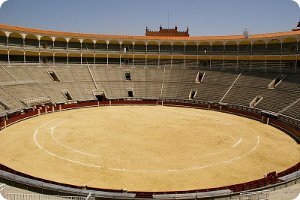 The "Las Ventas" Bullfighting (Plaza de Toros de Las Ventas in Spanish) is the most famous bullring of Spain. It is located in the East of Madrid (in the Salamanca district), in Alcalá street. The bullfighting season starts in March and ends in December; bullfights are held every day during the feast of San Isidro (20 days), and every Sunday and holidays. The sessions start at 18:00 or 19:00 hours. 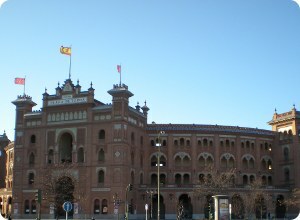 The bullring was designed by an architect called Espeliú and it was inaugurated on June 17, 1931. Its style is Neo-Mudéjar, this impressive building is formed of red brick and ceramic tiles. It is divided in a ring (has a diameter of 60 meters), and a group of zones called "patios". The seating capacity is divided into 10 "tendidos" (group of 27 rows), four of them in the shade (9, 10, 1 and 2) and the rest in the sun or sun/shade. The prices of the tickets are more expensive in the shade and in the rows which are nearer to ring. It has a seating capacity of 23,800 spectators. Today the ring is also used for rock concerts, political meetings, tennis court, Red Bull X-Fighters, etc. The San Isidro Fair (Feria de San Isidro in Spanish) is a series of bullfights held in Las Ventas, between May and June, around the feast of San Isidro (Madrid's Patron) on 15 May. It's one of the most prestigious bullfighting festivals in the world. The bullfights which start on May 11th, and go on for over a month, are probably the most important (and best) that you will find anywhere in Spain. They attract the best matadors and, obviously, tickets are both hard to come by and expensive. It was created in 1947 by entrepreneur Livino Stuyck who, by taking over management of the bullring, decided to bring together in one continuous pass, coinciding with the feast of San Isidro, all bullfights that were held in May. The sessions start at 18:00 or 19:00 hours. * Lines 2 or 5 - Las Ventas station.